There are several mythological cities or islands known to man around the world. Thanks to the advancements in the field of archeology and science, some of these cities are discovered by man. One of these cities is the beneath the famed Yonaguni Island. Strange pyramids and ancient structures are seen underwater. Are these structures made by a capsized advanced civilization? The ruins are highly elaborate to be found in Japan. These structures are too complex for ancient men to build it. The ruins consist of highly advanced stadiums, paved roads, temples with strange scripts, and a huge castle fitting for a king. Like Rome, it appears to have a public bath system and irrigation. 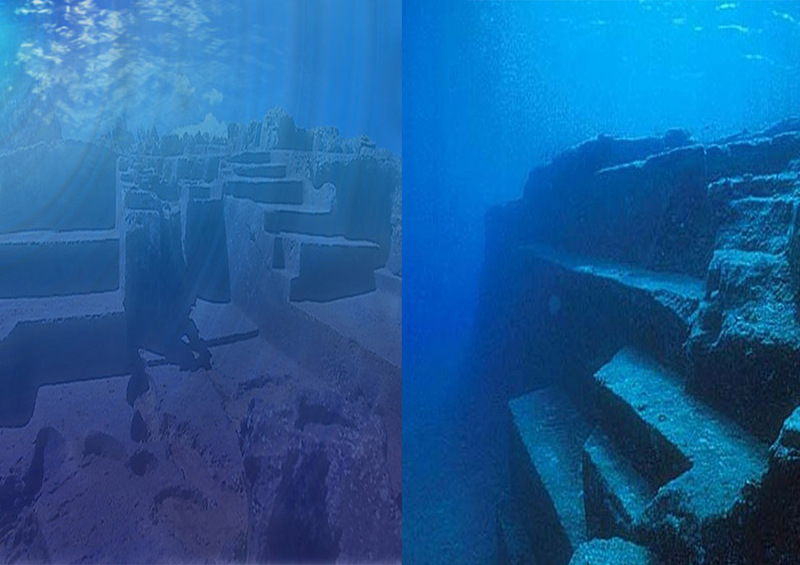 The strangest structure from the sunken city would be the sunken pyramids. Scientists and archaeologists are baffled by the discovery of these islands. According to expert calculations, the city beneath the Yonaguni island sank around 6,000-5,000 years ago. These estimates strangely coincide with the creationist estimate of the Great Flood 5000 years ago. It still remains a mystery of how and when the city met its end. It might be caused by extreme seismic or volcanic activity thousands of years ago.